StudyBlue, a studying platform for college students, has raised $3.65 million in Series A funding from undisclosed investors. This investment brings the startup’s total funding to $6.5 million. 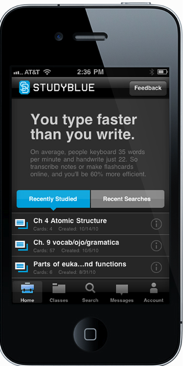 On StudyBlue, students can upload or transcribe their class notes, create digital flashcards as well as study guides. The platform will intelligently generate quizzes from a students notes and provides a place to store any notes in the cloud. StudyBlue will organize notes, and create flashcards from notes that can be accessed on a mobile phone or can be printed. Over the past two years, the service has expanded from 25 to more than 500 campuses in the U.S., with more than 100,000 students using the platform. While StudyBlue offers an iPhone app, the startup will use the new funding to develop Android and iPad apps. The investment will also be used to expand to other university campuses.